Start your adventure now by contacting us and we will be delighted to give you a ‘Try a Dive‘ during one of our winter training sessions in the ‘Blue Pool’ Monkstown (Dun Laoghaire Rathdown Leisure Services). We also welcome people who have gained some diving experience (perhaps on holidays) and would like to dive regularly in Irish waters. Fancy making a splash? Ever been snorkelling before? Then you may like to try SCUBA. 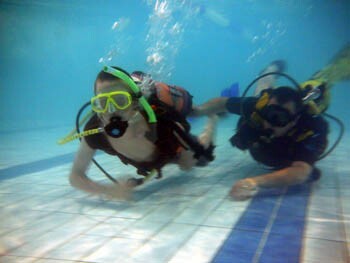 The main aim of our Try a Dive night is to introduce people to SCUBA (Self-Contained Breathing Apparatus) in the safety and comfort of a pool. This allows you the opportunity to enjoy the novelty of breathing underwater and the sensation of weightlessness with a view (hopefully) to taking further training, which would lead to a qualification such as Club Diver. Many people want to try equipment without further commitment and we are happy to facilitate them during these try-a-dive evenings. Super fitness is not required, nor is an ability to swim well necessary for this trial session. Our priority is to ensure an enjoyable introduction to SCUBA in a safe and controlled environment. Try a Dive can help you save time and money by finding out in advance if you like diving or snorkelling. If you’d like to try a dive with us you please contact us here!